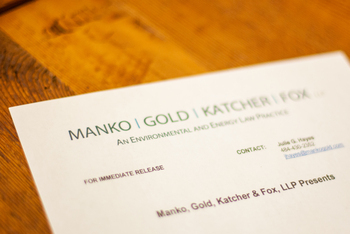 Manko, Gold, Katcher & Fox Partner Brenda H. Gotanda was featured on ThinkTech’s Making Leadership Work series on a program entitled “Cross-Country Law Practice is the Way of the Future,” on Monday, January 29, 2018. In the interview Gotanda discussed how, after over two decades of practicing environmental law with MGKF in the Philadelphia and New Jersey region, an opportunity arose to relocate to Honolulu, Hawaii when her husband became President of Hawai’i Pacific University. She embraced the chance to expand MGKF’s environmental, energy and sustainability law practice to Hawaii and, after passing the Hawaii bar exam, was sworn in to the state bar at a ceremony at the Hawai’i Supreme Court. In addition to developing the firm’s Hawai’i practice, Brenda has continued to represent and counsel clients on Pennsylvania and New Jersey matters and to lead MGKF’s sustainability practice group. She explained how today’s advanced communication technology provides a virtually seamless link with her mainland colleagues and clients and she provided insights on how to effectively support clients from a distance.